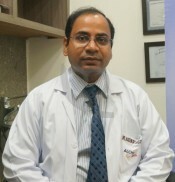 Dr. Aseem R Shrivastva, M.B.B.S, M.S(General Surgery), M.Ch( Cardiothoraciac Surgery), is the director of the Division of Paediatric Cardiothoracic Surgery at the Institute of Cardiopulmonary Sciences of Alchemist Hospitals- Panchkula and Gurgaon. Prior to joining Alchemist, Dr. Srivastava has worked at prestigious institutions in US. Dr. Srivastava completed his basic medical studies from GSVM Medical College, Kanpur. Thereafter, he pursued his post graduation in General Surgery from the prestigious King George Medical University. Succeedingly, he opted for Superspecialization in Cardiaothoracic Surgery from the renowned GB Pant Hospital, New Delhi. Following this, he worked as a Cardiac Surgeon in Delhi for nearly 4 years and then moved to US to work on the most prominent programs in Paediatric Cardiac Surgery. He accomplished specialised training in Cardiac Surgery at 'The Children Hospital of Philadelphia' & 'The Children Hospital of Pittsburgh of UPMC' tailed by attaining practical clinical experience from the East Carolina Heart Institute where he got extensive experience in minimally Access / Robotic Cardiac Surgery. Dr. Srivastava is a member of various national & international associations and actively participates in conferences & workshops to hone his practical skills and meet with the latest advancements in the field of cardiological surgeries.